I like baseball. I really like it once hockey is done, but the transition (hockey-baseball season, which would be hockey-basketball-baseball season if I were more than a casual b-ball fan) is tough. On the one hand, you’ve got all the hope of a new season, when anything is still possible except seeing Yu Darvish pitch. 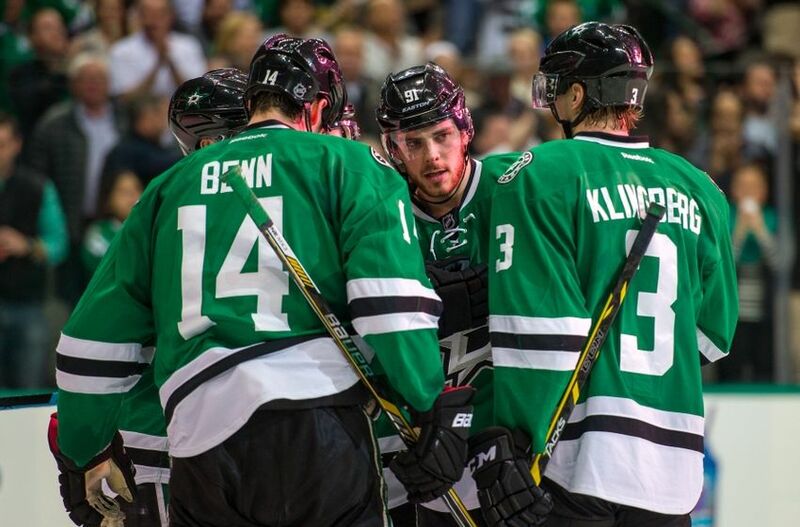 On the other hand, my beloved hockey is winding down and I’m going to go three whole months without it (five months without Stars hockey). But at the same time, full NHL season tickets can take up a lot of time. It’s a commitment. Because of the Dallas Stars’ geographic location (and because teams in “non-traditional” markets are the NHL’s red-headed stepchildren), our game schedule towards the end of the season tends to be no home games for ten or twelve days, then three games in five days (3/19/15 – 3/23/15). With baseball, though, we only go to a few games a month. And hockey games take some gear, even if you’re just watching. It gets cold sitting there! Long sleeves, wooly socks, lap blankie, mittens, none of which we can even stand to put on, this time of year, until we get inside AAC. So we end up kind of counting down to the end of having to pack everything up and rush to get to the train. And there are some hockey seasons, like this one, where we can just use a break.